BEACON FALLS — Most high school coaches take for granted the fact that their athletes already know how to compete in their sport when they come to tryouts as freshmen. Woodland boys swimming coach Tom Currier definitely doesn’t take that assumption lightly, and that’s why he’s so excited about the half-dozen rookies who joined the Hawks for the upcoming winter season. The freshmen will mix with about a dozen returners as the Hawks look to make a splash this season. Currier isn’t the only member of Woodland’s program who is looking forward to all the new blood in the pool. Stow is one of three seniors on the team, along with Chase Chura and Victoria Iannone. 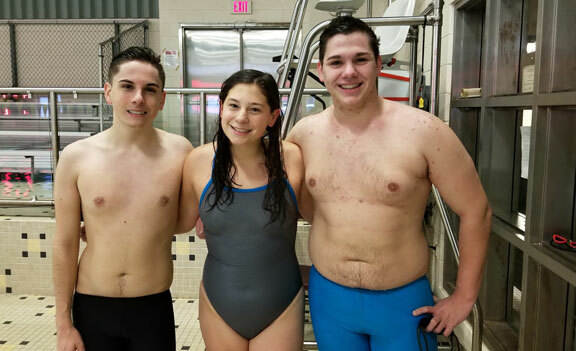 Other key returners include Greg Aldrich, Zac Bertrand, Zack Arisian, Jeff Varesio and defending Naugatuck Valley League diving champion Riley Clark. Clark won the league title last year as a sophomore, scoring 394.45 points over 11 dives to edge Sacred Heart’s Ben Gomes by 1.05 points. Clark holds Woodland’s six- and 11-dive records, and his presence will provide a boost to the Hawks in more ways than just the scoreboard. Aside from Clark’s diving abilities, Currier foresees his team’s strength being in the backstroke, breaststroke and butterfly events. The Hawks also have plenty of togetherness and camaraderie that makes the athletes happy to be in the pool with each other every afternoon. Woodland will open the season Tuesday at Oxford. The Hawks will host Northwestern in a nonleague meet next Thursday, and they’ll have two weeks off from dual meets before resuming their slate in 2018.